My name is Master Khaldoun Al-Atrash and I am the president and owner of Flying Kick Fitness. I am a 7th degree black belt and have been practicing Tae Kwon Do for over 36 years and have been teaching for 32+ years. I competed for 9 years, including 5 years at the national level, and have won numerous grand championships in both Olympic style and open American style sparring. As an elite competitor I had the honor of fighting World Champions many times. 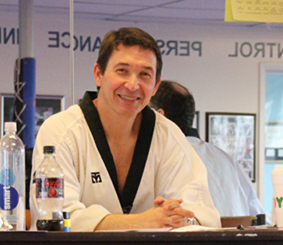 I have also studied several other martial arts and I bring elements of these together with Tae Kwon Do to create a unique curriculum to create the best possible learning experience for my students. The martial arts provide a path for lifelong learning and improving oneself both mentally and physically. In addition to the obvious benefits for physical fitness, self-defense, coordination, balance, and strength, Tae Kwon Do more than any other martial art helps students in many different areas of life, including discipline, self-esteem, self-control, and confidence. The challenges children (and adults) face and overcome here in the dojang (studio) comprise a transformational journey unlike any other sport. Many students have studied with me for a decade or more. It is a great joy to me to have the honor to instruct and guide so many children and adults as they grow into their fullest potential to become champions in life. At the heart of any school is the quality of the instruction and the interaction between teachers and students. The ability to teach is both a gift and a responsibility that I do not take lightly. Decades of teaching and learning from my own students have honed my natural teaching ability. Similarly, I have always placed a high priority on hiring gifted and accomplished instructors to assist me. I believe that truly understanding each student’s needs and capabilities is critical to a successful partnership between teacher and student. At Flying Kick we approach each student as an individual. Not every student learns the same way, but I believe that everyone can learn the martial arts to the best of his or her ability. Therefore, respecting each student’s ability is one of the most important principles that we work with here at Flying Kick, and I believe that you will find that this is what separates us from other studios. I welcome students of all abilities. My students quickly realize that Flying Kick is a safe place and a caring community where their abilities and accomplishments will be recognized and celebrated. My commitment is that I am here along with my devoted staff to serve my students so that each one will learn, develop, and achieve to their fullest capability. I have striven to create a place where everyone feels welcome and comfortable as part of the Flying Kick community as we progress through this journey together. Together we can learn and grow through the art of Tae Kwon Do. This is one of the true essences of the martial arts. I have devoted my career to creating a community in which each student can learn, grow, and achieve in a fun, enjoyable, and supportive environment.